Columbus, OH — Beginning with the foal crop of 2019, the primary means of USTA horse identification will be the microchip. 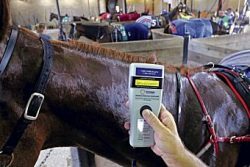 Beginning with the foal crop of 2019, the primary means of USTA horse identification will be the microchip. USTA/Mark Hall photo. To watch a video explanation and demonstration of the microchipping process hosted by the USTA’s Wendy Ross with Midland Acres’ doctors John Mossbarger and Bob Schwartz, click here. In addition, Merck has agreed to partner with the USTA, for free, a lifetime subscription to their HomeAgain rescue services, which is a proactive network of veterinarians, rescue facilities and volunteers who are immediately notified in an attempt to help locate lost animals. The program maintains owner contact information that proactively prompts owners to update it during the annual membership renewal process and through other member communications. This is an added benefit for horses that are in need of rescue or connected via the USTA’s Full Circle program. With Merck’s patented Bio-Bond® process, the microchips are encased in an insert micro-capsule made of bio-compatible material. The process enables the animal’s tissue to permanently anchor the microchip at the desired anatomical site. HomeAgain/Destron Fearing microchips stay where they should for the health of the animals and for reading convenience.